James McKenzie was born on November 12, 1935, in St. Louis, Missouri. He enlisted in the U.S. Air Force on December 2, 1954, and after completing basic training and airborne weather operator training, he served as a B-36 Peacemaker airborne weather operator with the 348th and then 347th Bomb Squadrons at Fairchild AFB, Washington, from March to September 1956. His next assignment was as a B-36 airborne weather operator with the 92nd Air Base Group at Fairchild AFB from September 1956 to January 1957, and then as a WB-50 Superfortress airborne weather operator with the 59th Weather Reconnaissance Squadron at Kindley AFB, Bermuda, from January 1957 until he left active duty and entered the Air Force Reserve on April 12, 1959. SSgt McKenzie next entered Officer Training School on November 9, 1962, and was commissioned a 2d Lt in the U.S. Air Force at Lackland AFB, Texas, on February 5, 1963. 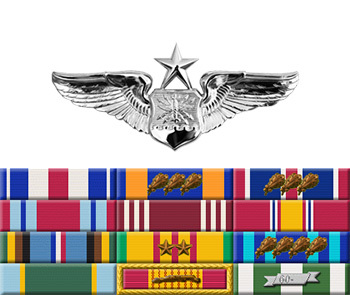 Lt McKenzie next attended Navigator Training and was awarded his navigator wings at James Connally AFB, Texas, in March 1964, followed by service as a C-130 Hercules navigator with the 774th and 772nd Troop Carrier Squadrons at Langley AFB, Virginia, from April 1964 to February 1966. He deployed with the 772nd Troop Carrier Squadron to Mactan AB in the Philippines from February 1966 to March 1967, and then served as a C-130 navigator with the 38th Tactical Airlift Squadron at Langley AFB from March 1967 to March 1968. Capt McKenzie next served as an MC-130E Combat Talon I navigator with the 7th Special Operations Squadron at Ramstein AB, West Germany, from March 1968 to August 1971. During this time he served as navigator aboard the MC-130E "Cherry One" during the Son Tay Raid, a clandestine mission to rescue American Prisoners of War in North Vietnam on November 21, 1970. His next assignment was as a navigator instructor with the 3539th Navigator Training Squadron (later redesignated the 451st Flying Training Squadron) at Mather AFB, California, from August 1971 to July 1973, followed by service as Chief of the Navigator Observer Research Section with the Air Force Human Resources Lab at Williams AFB, Arizona, from July 1973 until his retirement from the Air Force on June 1, 1978. 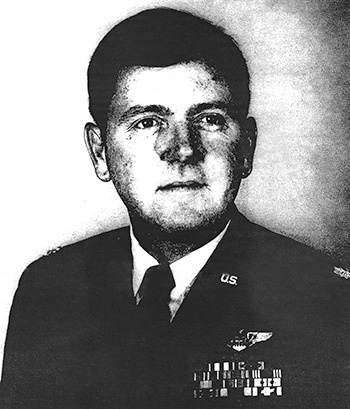 Captain James F. McKenzie, Jr., distinguished himself by gallantry in connection with military operations against an opposing armed force during the Prisoner of War Search and Rescue Operation at Son Tay, Vietnam, on 21 November 1970. On that date, Captain McKenzie voluntarily participated as a Navigator in a combat flight which safely led the force into Son Tay. Through accurate and timely navigation, the force arrived at Son Tay without incident, the enemy forces were completely surprised, and the mission was successfully completed. By his gallantry and devotion to duty, Captain McKenzie has reflected great credit upon himself and the United States Air Force.